This is the Black Arrow from the blockbuster motion picture trilogy, The Hobbit! Forged by the Dwarves of Erebor, the Black Arrow was intended for use in slaying the dragon, but failed. All the Black Arrows except for one were lost forever, and Bard, a fisherman in Laketown and expert bowman, managed to keep the solitary arrow hidden for Smaug's imminent return one day. 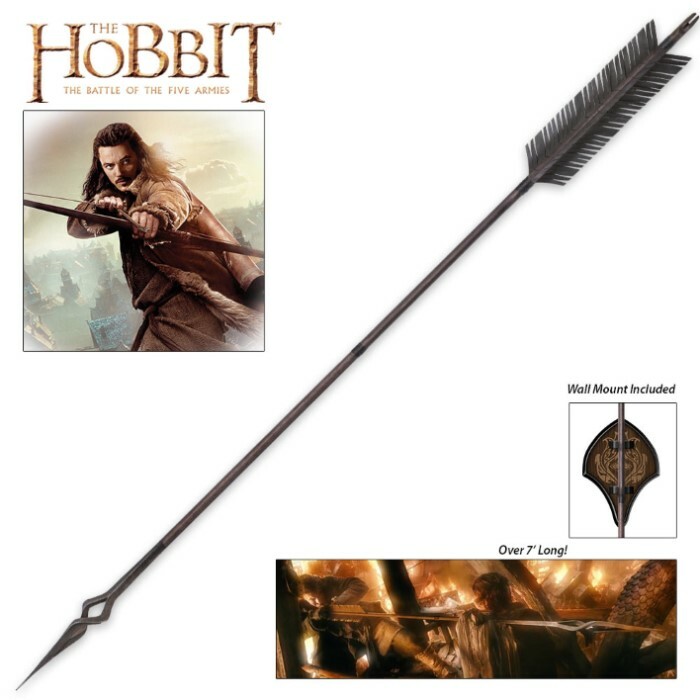 Now you can own this replica Black Arrow and continue with your officially licensed Hobbit collection. Oddly, I've noticed if it isn't a 5 star, super positive review, BUDK will not approve it. Way to go guys. Anyway, I recently received this as a gift.... and its waaaaay better than I expected! I'd seen some complaints about the fletchings, but honestly, they're not that bad. Once assembled its pretty solid, no wobble, the plaque may be the only downside. The threading on the spear shaft is pretty much what keeps it from sliding down and allowing the arrow head to rest on the floor. So, hopefully the glued the thread down. If you had reservations on this one, for $60 it is well worth it. Just make sure you have room, its freakin' huge! I'm Happy for the most part. I'm slightly disappointed that the fletchings are thick plastic and that the threading isn't through all of the holes. When I got mine, 2 of the 3 fletchings were loose, the glue didn't hold so the only thing holding them on was the threading. The hand threading, by the way, is quite loose through the fletchings, but that's an easy fix. The arrow head is amazing and once all 3 pieces are screwed together, is has a very nice sturdy feel. Even with the issue I had with mine, it's still a pretty dang neat replica from the movie. This piece is unlike anything else United has made to date. First off, it's 7 feet long and has a sharpened steel head as long as the blade of Sting. The back of the box says the design was originally cast in regular arrow size, but director Peter Jackson loved it so much he had it made harpoon-scale for the official Black Arrow. It comes in three pieces and must be assembled, but the copper screw ends are long enough to make it quite sturdy. The detailing is superb and I couldn't be happier to own this mighty Black Arrow. I knew this was going to be a big arrow, but seeing it in person will blow your mind. The metal arrow head is the size of Sting and when fully assembled is a sight to behold. A must have for The Hobbit collector and a great item for anyone especially at the price. Well worth it.